The Texans took advantage of Andrew Luck’s injury and beat out the Colts for the AFC South title in 2015. The quarterback position will be a focus for all four teams in the division. Two young QB’s will look to make steps forward while two experienced signal callers will look to get their teams back to the top of the division. The Texans won the division but laid an egg in the playoffs as the Chiefs beat them 30-0 in Houston. The Texans focused on upgrading the offense in the offseason. Brock Osweiler is the new starting QB in Houston, Lamar Miller is the new starting RB and Braxton Miller was drafted to create some big plays for the offense. Andrew Luck returns from an injury shortened 2015. The Colts still finished 8-8 and are confident they can be a playoff team once again with Luck back. First round pick Ryan Kelly out of Alabama will start at Center and be in charge of making a seemless transition to hiking the ball to Andrew Luck. 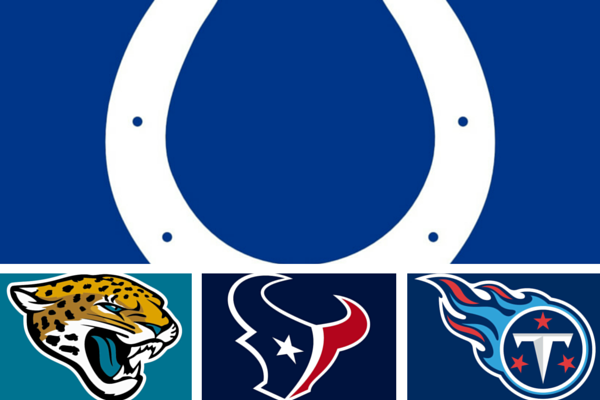 The Jaguars are the team to watch out for in 2016. They look like they’re ready to challenge teams each week and should be much improved in 2016. Blake Bortles made strides in his second season and is poised for a breakout 2016 with his young wideouts. The defense adds rookies Jalen Ramsey and Myles Jack who should make plays right away. Last year’s top pick Dante Fowler will make his NFL debut following an injury. Malik Jackson was brought in to anchor the defensive line. DeMarco Murray was acquired to ease the pressure on Marcus Mariota. The Titans will look to run the ball and hopefully keep defenses guessing so Mariota can have more chances to make plays. The Titans still need to add depth to be contenders. They’re going to have trouble coming from behind in games because of their lack of big play ability in the passing game.